Re-engaging with our external data users – Open Data Aha! On Tuesday night some of us from across government departments involved in the Government Data Programme caught up with a group of external data users over a few mince pies. As always it was good to hang out with a group so passionate about data and its uses, but it was also a relief to start to re-engage in a more systematic way following the Spending Review and other recent organisational changes. After our Minister Matt Hancock kicked things off I ran through a presentation designed to give a flavour of what the new data programme is up to. There are still plenty of details to work through in this, but there is no shortage of existing activity right across Whitehall: from data science, registers, open data and preparations for possible data access legislation. I’ve put the slides I used up on Slideshare. John Pullinger the National Statistician and Chair of the Data Steering Group spoke about the need to put data into action. He also underlined the importance of the external data user communities in helping us keep up the pace and quality of this work, and their role in holding us to account as we move from proposals to implementation. 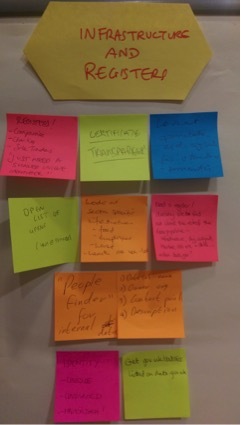 There was then some more opportunity to munch on the mince pies, and we invited comments and wishes on various aspects of the programme via the inevitable GDS post-it notes. The New Year will see more systematic engagement with our external data user communities, and the conversations yesterday will help shape what that looks like. For example, I was taken by points made in conversation with Sam Smith and some others about the power of more deliberative forms of engagement, as in the data sharing policy engagement process and the development of the UK’s Open Government Partnership National Action Plans, though of course this type of deep engagement does come with additional costs. Either way, it was clear from the feedback that one of the needs we all have is to channel and prioritise those datasets that have yet to be opened up, and with ODI we will need to find an elegant way to do this. This data agenda gets energy and utility from the interplay between government and external users, and it’s quite unlike anything else I’ve seen personally in public service reform over the years. And as I blogged the other day, even when the conversations get awkward (which they sometimes do) and when there are disagreements (which there sometimes are) it is still a tremendously powerful way to improve the quality of our work.